Each week gets a bit more stressful, and each week we prepare ourselves to say goodbye to very talented artists. Last week was tough. Tess Boyer and (to my surprise) Bria Kelly received the lowest number of votes and were sent home. Last night, the Top 8 performed... and tonight, three of them go home. You really can't get more stress than that. It was an interesting night. 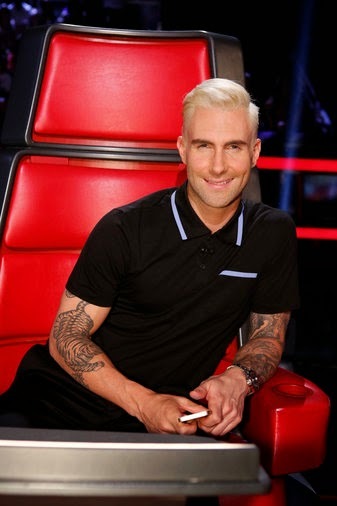 Adam's now a blond (and that's all I'm saying about that). Next season's two new coaches introduced themselves with great performances. And, one contestant rocked the stage in a way that may have been THE defining and turning point in her career. Everyone performed their best, but next week's semi-finales has only five spots. 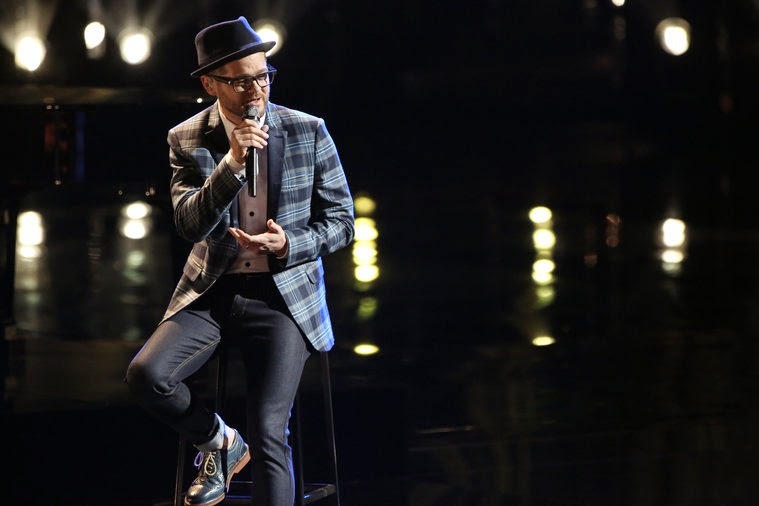 Topping the charts at number two on iTunes this week was Josh Kaufman with “I Can't Make You Love Me.” Josh is one that surprised me this season. Originally I didn't think he'd make it to the Top 10, but Usher is an amazing coach, and Josh is an amazing singer. With a great stage setting and a very emotional vocal delivery, Josh reminded me a lot of Richard Marx. He sat on the stool but was able to move the entire audience. As always, he tone was great, and he's just a great vocal and visual artist. 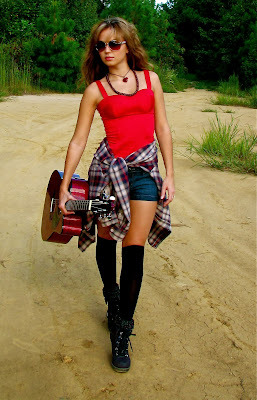 Kristen did a beautiful cover of “I Drive Your Truck.” Being the only remaining member of Team Shakira, I imagine the pressure Kristen was feeling was pretty intense, but she still delivered a solid and strong performance. The light fog on stage created a mood for the song, and her vocals held and shared the same mood. Her tone was well maintained, but did extend beyond the music a few times. She held her pitch, and gave us some heartfelt and emotional vocals. It was good, but she has been much stronger in her deliveries in the past. Adam was originally against Delvin Choice doing “I Believe I Can Fly,” but eventually decided it was the perfect the song for him this week. During rehearsals, Delvin had such a strong emotional connection to the song that he actually broke down in tears. Unfortuneately, I didn't really see that level of emotion in his actual performance. His stage was simply set with only him being visable. His strong vocals resonated from the stage in all directions. Half way through, the curtain behind him rose and exposed six backup vocalists, and the mood shifted to a semblance of a large church performance. Near the end, three brass players moved onto the stage and completed the mood of the song. It was really well done, and technically it was almost perfect. But, the performance just didn't move me as much as the clip from rehearsals. 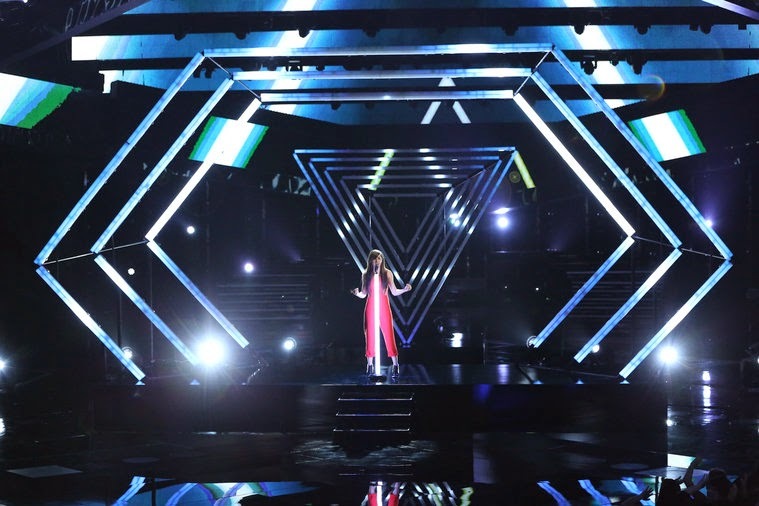 Blake's 'Country Soprano' Audra McLaughlin gave us a great rendition of “Forgive.” With a simple accompaniment of a single white piano covered in large colored candles, Audra delivered a great vocal and emotional performance. I don't what it is about Audra, but her voice and movements capture my whole attention. Her tone is always great and perfectly matched to the emotion the song wants to convey. It's like she takes the feelings in her heart and transforms those into the tones in her voice. Her eyes always and clearly tell the story, and I think that's partly how she is able to connect with her audience on a level that's rare with many artists. I liken her in the ranks of Martina McBride and Reba, and regardless of what happens on this show, Audra has an amazing career waiting for her. Jake Worthington followed Audra and sang “Hillbilly Deluxe.” With the stage transformed into a full country saloon setting, Jake showed us again just how pure and deep his country roots are. The power and conviction in his vocal delivery reminds me of Garth Brooks. There really isn't much to say about his performance last night that hasn't already been said. The only thing I would critique is his 'performing' part on stage. His voice gives him a commanding presence, but a little more 'dancing' or 'higher energy' movements across the stage would put him into a whole new level. Closing out the show this week was Christina Grimmie with “How To Love.” She was worried that it would be too similar to her performance last week (doing two rapper songs in a row), but those worries were put to rest once she performed. Within the first bar of the song, you could already tell that she succeeded in making it her own. Her range and power came effortlessly and flawlessly, and her upper register is just insane. The length of some notes she held went beyond what one could deem impossible, and she did it without even the smallest waver in pitch. Christina nailed what she set out to do and showed amazing strength and feeling that had the crowd go into a frenzy that just wouldn't stop. 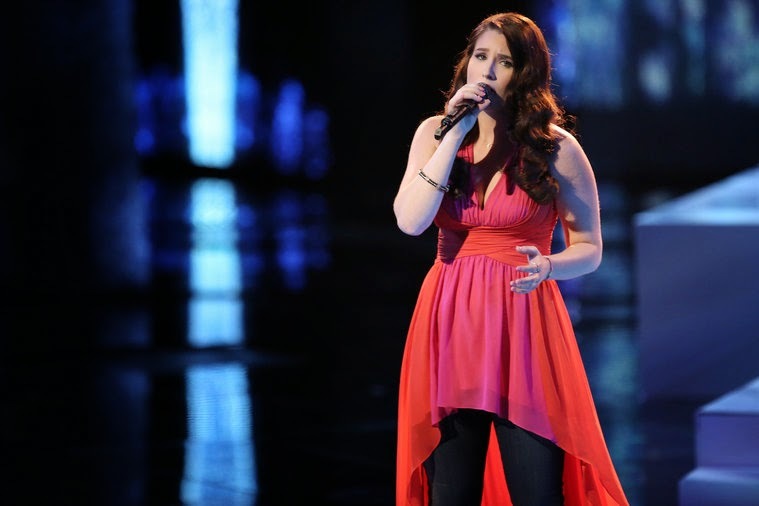 In fact, the crowd was screaming and applauding so much and for so long, that Christina started to get a bit emotional. I think that's what I love about her the most... she respects her fans, and she becomes overwhelmingly happy when they are happy and like what she did. You can tell that she does what she does for her fans, and her fans are more important to her than anything. Once we reached the Top 12, predicting the outcomes of each episode has become increasingly hard. The talent of every artist left is off-the-charts, but they are all very different in style and delivery. Even the three country artists are in very different places and very different kinds of artists. After last night's performances, (and because of the 5x multiplier rule for reaching the iTunes Top Ten), Christina (#5) and Josh (#2) are absolutely safe. Not only will we see them in next week's semi-finals, I'm pretty sure we will also see them in the Finale. Though she didn't quite reach the iTunes Top Ten (#14) on iTunes, Kat Perkins delivered an unforgettable and amazing performance that will easily advance her to the Top 5. Sisaundra vocal talent goes beyond many artists, but her style targets a very specific fan base, and I don't think it's large enough to advance her further. Delvin is also extremely talented, but like Sisaundra, I feel his style is also very specific and not broad enough to advance him further. So that leaves Jake, Audra, and Kristen. Although Audra's single was in the Bottom Three among the others on iTunes, I believe her fan base is larger and strong enough to (deservedly) push her through to the semi-finals. I am torn between Jake and Kristen taking the final spot in the Bottom 3. Both are great country artists, but both differ so much in their styles. Both connect with the audience and fans. Both deliver flawless performances, and both have a pureness about them, but both are so different that I really can't decide... but if I had to guess, I think the third one in this week's Bottom 3 will be Kristen. So to sum it up – This week, Sisaundra, Delvin, and Kristen will be going home. Tune in to NBC tonight to see who does go home and who does move on to next week's semi-finals of The Voice. You can still support your favorite Voice artists by buying their songs on iTunes. Every purchase until the Finale does count as a vote towards that contestant's final vote total... used to determine who will be named "The Voice"